The magnificent American mahogany Hepplewhite antique secretary shown just below deserves a web page of its own, but you will soon find antique living room furniture here that complements this wonderful early American antique. This secretary was purchased from a Rhode Island dealer in 1937. The piece is in all but perfect condition, with only a few minor nicks and cracking. The two glass doors have six panes of glass each, including 2 beautifully arched panes, all believed to be original glass. The precision moldings and inlay patterns on the 3 bowed facade drawers and base are well preserved. Its decorative hardware, in particular the beautifully decorated drawer pulls and spindled finials are also all original. 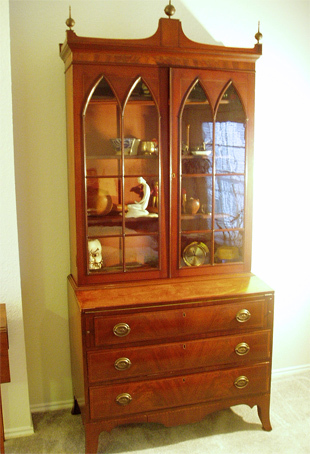 The finish on this secretary is an example of classic American antique wood finishing artistry. we'd surely love for you to list them on our site right here for all to see! Site navigation note: Remember when you mouse over any of the thumbnail images it will replace the larger image. When you move away from the rightmost image in a series the original larger image will be restored.